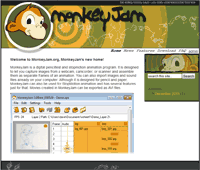 GiantScreamingRobotMonkeys :: MonkeyJam has a new home! Nice to see MonkeyJam back! just update Monkey Jam already. Welcome to the creative noodlings of David Perry, artist, animator, teacher. powered by habari and sitewinder plugin. © copyright 2011-2019 David Perry all rights reserved.